If discography provokes your typical pain in the back and/or leg there are several options in treatment. The first is injection of water soluble corticosteroid into the disc space. This can give lasting relief in the occasional patient but up to 1 in 3 experience reasonable short term relief. Currently there is no entirely satisfactory solution for discogenic pain. Milder cases may respond to prolotherapy to the supporting ligaments. 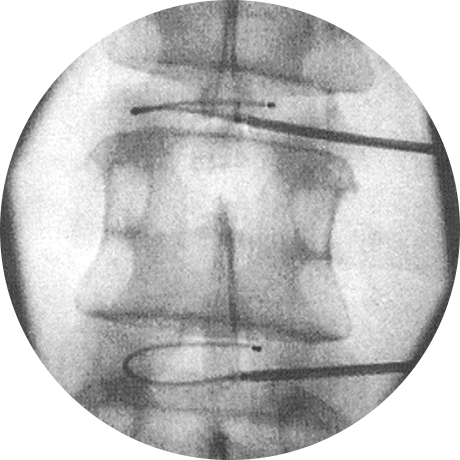 Severe disabling pain may be better treated by surgical fusion or disc replacement. Moderately disabled patients may prefer to try nucleoplasty, Gelstix or cooled RF (biacuplasty). Nucleoplasty or gelstix are both options offered at Oving Clinic but the degree of disc degeneration cannot be too severe (ie more than 50% narrowing) or there will be no benefit. We are still waiting for good evidence on the application of coblation nucleoplasty for purely discogenic pain, when there is no contained protrusion.